How rare is it for Army to appear in a Top-25 poll? With its win over Colgate, Army is ranked for the first time in 22 years. 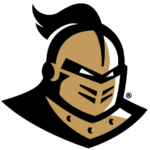 Propelled by leading rusher Darnell Woolfolk’s three-touchdown performance, the Knights secured back-to-back nine-win seasons for the first time since 1945-46. After nearly knocking off Oklahoma in Norman, the Knights have rattled off seven victories in a row. The Bulldogs bounced back from their disappointing loss to Boise State in a big way. In defeated the Aztecs, Fresno State clinched the Mountain West Conference’s West Division. The Bulldogs will face the winner of this week’s Utah State–Boise State showdown in the MW Championship. That’s one way to end a three-game losing streak. A week after scoring only 10 points in a narrow loss to Northwestern, the Hawkeyes raced out to a 35-point advantage at halftime. Mekhi Sargent and Toren Young combined for four scores on the ground en route to a blowout victory. It sure is nice playing against a defense other than Alabama’s. Nick Fitzgerald threw four touchdown passes — on only 14 attempts — and added another on the ground for the Bulldogs. A win over their in-state rival would cap off a respectable regular season. It all comes down to this for the Broncos. A win over Utah State would result in a rematch with Fresno State in the Mountain West championship game. Quarterback Brett Rypien and tailback Alexander Mattison have been stellar all year — and they will need to come up big if Boise wants to knock off the Aggies. Kentucky came away with a victory but its offensive woes continued against the Blue Raiders. Benny Snell Jr. rushed for 116 yards, but needed 26 carries to get there. A trip to Louisville should help the Wildcats’ offense get back on track. The Wildcats have won seven-straight Big Ten contests after opening conference play with a loss to Michigan. Northwestern should have no problem this weekend against an Illinois team coming off a 63-point loss. All eyes will be on the Michigan–Ohio State game to see whom Northwestern will play in the Big Ten championship game. The Orange had no chance against Notre Dame once quarterback Eric Dungey was knocked out of the game. If Dungey can’t play this week at Boston College, the Orange may be destined for a fourth loss. Utah was pleasantly surprised by the play of Jason Shelley — a redshirt freshman QB — in only his second career start. Utah’s victory clinched the Pac-12 South and a spot in the title game. The Utes are in for a tough game with the Cougars this week. It wasn’t pretty, but the Nittany Lions won their eight game of the season this past weekend. Maryland should provide an interesting test for the Lions. Coming off a heartbreaking loss to Ohio State, there is a real chance of a hangover for the Terps. However, Penn State is in a similar position having no chance of winning the conference. With that being said, I expect PSU quarterback Trace McSorley to go out on a high note. SEC scheduling is something else. In the midst of conference play and a week before a meeting with Florida State, the Gators were gifted a matchup with Idaho. 63 points later and Florida did what it was supposed to do. The Seminoles have been a disappointment all year, but it would be unwise for the Gators to overlook their rivals. The Mountaineers stumbled right before the biggest game of their season. In losing to Oklahoma State, West Virginia saw its hopes of reaching the CFP evaporate. A win over the Sooners would result in an appearance in the Big 12 title game. The Aggies went through a roller coaster of emotions on Saturday. Utah State took the lead with 43 seconds remaining, only to seemingly yield a last-second touchdown. Luckily for the Aggies, a penalty nullified the play — keeping the team undefeated in conference action. Washington would love nothing more than to knock Washington State out of the CFP discussion. A victory over Wazzu in Pullman would send the Huskies to the Pac-12 title game against Utah. In order to do so, Jake Browning will need to replicate his performance from this past weekend. The Longhorns kept their Big 12 title hopes alive with an impressive win over the Cyclones. If Texas can get the better of Kansas in its regular season finale, the Longhorns would advance to the Big 12 championship game where they would face either Oklahoma or West Virginia. The Buckeyes were lucky to survive their trip to Maryland. An errant pass in overtime kept the Buckeyes CFP hopes alive as they prepare for the biggest game of the season thus far. The winner of this weekend’s game against Michigan will represent the Big Ten East in the conference’s title game, and quite possibly set itself up for a spot in the CFP. LSU took full advantage of its traditional late-season battle with a non-conference juggernaut — this time one-win Rice — and found a rhythm offensively. 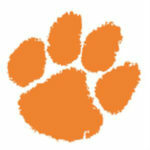 The Tigers will face a must tougher opponent this weekend. The Aggies have been competitive against everyone not named Alabama, and will likely challenge LSU in College Station. In routing Cincinnati, the Knights made their biggest statement since defeating Auburn in last year’s Peach Bowl. UCF still faces an uphill battle in reaching the CFP, but this victory surely turned a few heads. The Knights clobbered a ranked Cincinnati squad that has nine wins on the season. Let’s see what the committee thought of UCF’s performance. The Sooners still control their destiny in the Big 12, but their stock may have taken a hit this past weekend. Oklahoma’s pedestrian defense allowed Kansas to rack up 524 yards and 40 points. OU still has a chance to make the CFP with wins over West Virginia and Texas — though it won’t be easy with another poor defensive performance. Nobody made a bigger statement over the weekend than the Washington State Cougars. 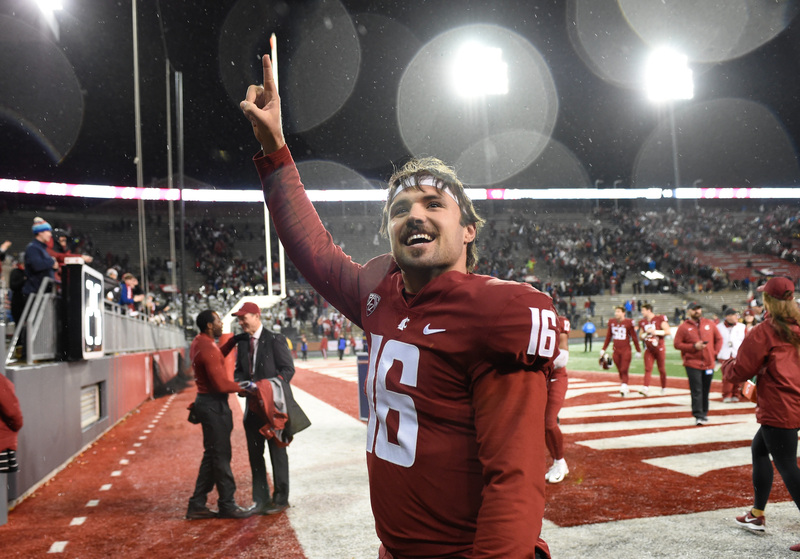 Behind Gardner Minshew’s seven touchdown passes, Wazzu held a commanding 55-14 lead at halftime. The Cougs eased off the throttle after the break en route to a 69-28 victory. 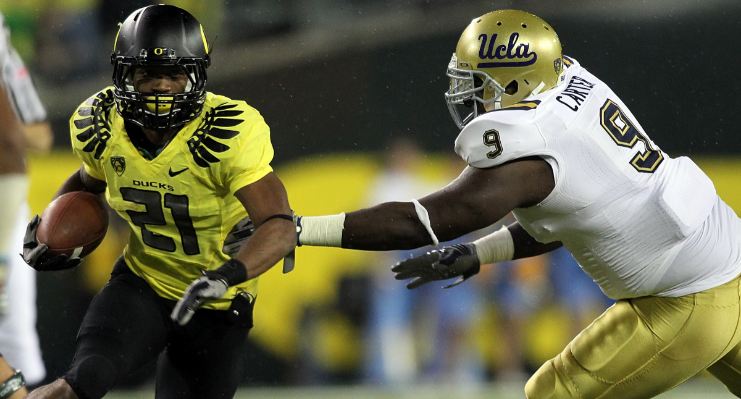 A win over Washington could put Wazzu within striking distance of a playoff spot. Keeping inline with the SEC tradition of scheduling a sure-win late in the season, Georgia manhandled UMass in Athens. Georgia Tech — riding a four-game winning streak — could pose a challenge. With a win over the Yellow Jackets, Georgia’s showdown against Alabama in the SEC title game would be a de facto play-in game for the CFP. Notre Dame is one step closer to clinching a spot in the College Football Playoff. With a win over Southern Cal, the Irish would finish the regular season 12-0. The Trojans are struggling mightily and shouldn’t challenge Notre Dame at all. Michigan avoided its trap game against Indiana — setting up a huge matchup with Ohio State in Columbus. A victory would send the Wolverines to the Big Ten championship game to face Northwestern. With a win this week Michigan would be one more conquest away from the CFP. Clemson continues to blitz the opposition into submission. The Tigers overcame a slow start against Duke — down 6-0 after the first quarter — and ended up winning their sixth-straight game by at least 29 points. With wins over South Carolina and Pittsburgh, the Tigers will clinch yet another trip to the CFP. Shocking everyone, the Tide were tied 10-10 with The Citadel at halftime. However, order was quickly restored after play resumed. 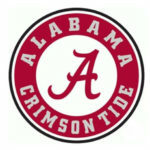 Bama outscored the Bulldogs 40-7 in the second half. A victory over Auburn is paramount before taking on Georgia in the SEC title game.